The toxicity of some common household cleaning products are usually pretty well known and indicated on their labels, yet many parents still keep them in use after having a child when they should be using baby-friendly cleaning product lines. Sure, adults may have little to no issues with these chemicals, but what about a baby or toddler, who crawls and moves very close to the ground, or likes to put things in their mouth that they shouldn’t? Obviously, you want to be able to keep a clean home for your children to ensure they have hygienic surroundings, but you want to be able to do so in a way that will not expose your children to a slew of different toxins. 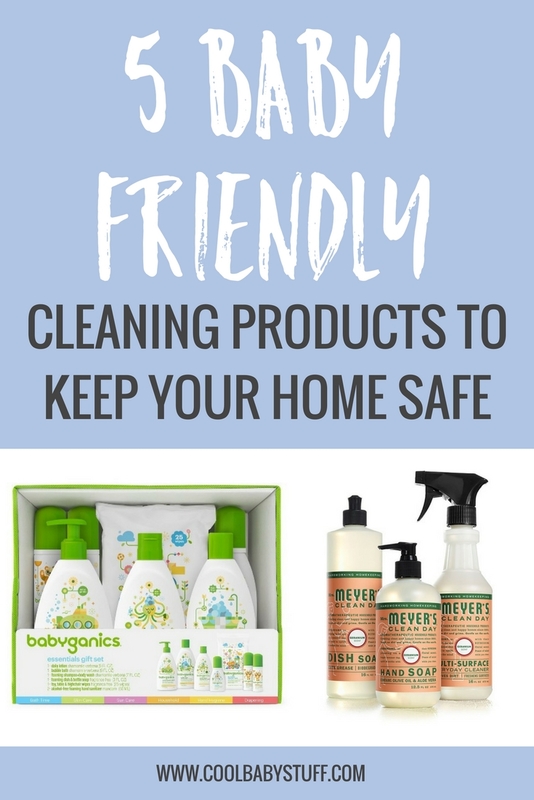 Moving some of these cleaning products to a higher shelf isn’t all that can be done–parents should consider the following baby-friendly cleaning product lines as alternatives to what they use to clean their household. We also have tips on how baby-proof your home, and how to keep these baby-friendly cleaning product lines safe. Founded in 2011, The Honest Co. was created by actress Jessica Alba and her husband as a result of frustrations in not being able to find safe, eco-friendly cleaning products to use around their new babies. The company provides an entire line of standard household cleaning products made from all-natural, non-toxic ingredients, and also produces baby products. You can get a free trial of some of their products here. Also founded by a mother (of nine children! ), Mrs. Meyer’s line of all-natural cleaners are characterized by their distinctive smells. Fragranced with essential oils, their products have smells like lemon, lavender, basil, geranium, and more. Not only are you missing out on the chemical component of common household cleaners, but that yucky chemical smell as well. Check out their website here. This eco-friendly range of products covers 3 types of cleaners – kitchen, laundry, and household. 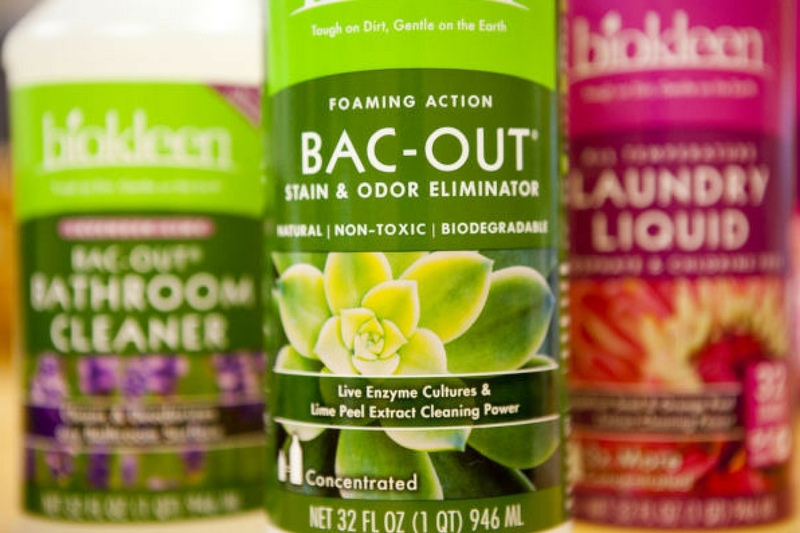 Family-owned Biokleen is committed to making only plant and mineral based non-toxic cleaners. Their website stresses that not only are these products safe for humans and the environments, but for pets as well! They are a very animal-friendly company. Additionally, their products are not tested on animals. More information here. Green Works is owned by Clorox and is a fairly common cleaner that can be found in almost all supermarkets and pharmacies. They specialize in multi-surface cleaners, like sprays and wipes, but also produce a laundry detergent and dishwashing liquid. Green Works supports the American Association of University Women to provide young girls with role models and explore scientific curiosities. Their website has a selection of science experiments to try with young girls (or any kids) here. As the name suggests, Babyganics is a range of products aimed at the care of young children and babies. In addition to standard household products, their line includes an amazing selection of specialty baby products such as diapers, diaper rash cream, sunscreen, cold relief chest rub, toy & highchair cleaner, and much more. See their full line here. If you’re interested in DIY, you can also create your own baby-friendly household cleaners using these instructions here. You might even save some money on cleaning supplies. Otherwise, all of the product lines above are tested and approved for use around children. There are many things out there which can pose a risk to your baby’s health, but eliminating all of the ones existent in your home set your baby up for success in health and happiness. Swapping out toxic products is a great way to limit negative chemical exposure for your baby. Not to mention, it’s great for you, your spouse, and your pets too! Camille is a New York native living in Nashville, Tennessee. She loves yoga, running, nutrition, and fashion, and is grateful for the opportunity to share important information with parents. You can check out more of her writing on her personal blog at www.serialoutfitrepeater.com.